Understanding Robotics is an introductory text on robotics and covers topics ranging from from the components of a robotic system, including sensors, to the industrial applications of robotics. The major factors justifying the use of robots for manufacturing are also discussed, along with the use of robots as a manufacturing tool, their impact on people, and the future of robotics. 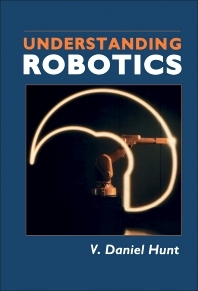 This book is comprised of eight chapters and begins with an overview of the roots of robotics and the use of robots in the manufacturing environment; advances in robot technology and typical applications of robots; reasons for using robots in the manufacturing environment; and the different manufacturing functions they perform, including visual inspection and intricate welding operations. A definition of the word ""robot"" is presented, and the impact of robots on jobs is considered. Subsequent chapters focus on the elements of a robot system, including the computer/controller, actuator power drive, and sensors; sensor applications in robotics; robotic usage by industry; economic justification of robotics; manufacturing technology and the role robotics can play in improving the United States' competitive manufacturing position; and the impact of robots on people and vice versa. The final chapter is devoted to market trends and competitiveness of the U.S. robotics industry and assesses the future prospects of robotics. This monograph should be a valuable resource for technologists and researchers interested in robots and robotics.